House of Pizza is an important customer of Bernick’s, and they’ve been an institution in Central Minnesota for over 50 years. Pacific Wok brought new innovation and a fresh take on “fast food” when House of Pizza owners added this restaurant in 2004. Bernick’s proudly partners with both of these restaurants as a distributor. I recently had a conversation with Brandon Testa, the owner of both House of Pizza and Pacific Wok in regards to our local relationship and their customer satisfaction - both restaurants have locations in St. Cloud and Sartell. It’s always good to take time to visit with our partners, check in on our relationship, and get their side of the story. A little backstory on Brandon – he’s a pretty well known and highly regarded local. He was featured by the St. Cloud Times in 2008 for their “5 Under 40” award. You can read his feature here. This is why we love what we do at Bernick’s. We get to work with incredible people like Brandon, and help their businesses grow right here in our community. Q: Why do House of Pizza and Pacific Wok partner with Bernick’s? Tell me a little bit about your decision to partner with us – especially because you chose to stay continuous with us as your service provider when you opened Pacific Wok. For us, there is no other option; in our eyes, Bernick's is by far the best from a soda and craft beer distributor standpoint. They have been our supplier since day one, and we don’t believe there’s anyone else that could truly do the job they do. Q: What does Bernick's provide you with, in terms of product and service? There has to be plenty to consider when you’re planning and running four separate locations, each with unique specifications and nuances. Bernick’s takes care of all our soda, soda equipment, some beers and juices, POS, and marketing of specials and promotions. What really sticks out about them is their service and staff, hands down. From the delivery driver to the marketing gal, to the service techs and response time, their service is awesome. Q: What do you expect from Bernick's, as your Supplier? And more importantly, do you feel you’re getting exactly what you need from us, and when you need it? As with all vendors, I have expectations that I hope are met in our partnerships. Many of my expectations depend on the situation; from our salesman standpoint, he meets and exceeds my expectations twice a week when I see him. It is obvious he is properly trained, very knowledgeable, knows his soda and beer products well, and asks me the right questions to know my business needs. Q: Bernick’s is big on community. What does this mean for you, House of Pizza, and Pacific Wok? I know you and your businesses support local charity, with Pacific Wok doing food shelf donations in the past, and running a holiday pizza sale at House of Pizza to match charity dollars. Being a small, local, independent shop like myself, it’s always nice to see bigger companies like Bernick’s enforcing the ‘give back’ mentality into our community; it’s a feel good movement for everyone. I feel good about choosing to partner with local businesses, especially larger ones like Bernick’s, that support other local organizations, schools, sports teams, etc., similar to how we do. When House of Pizza puts on events or trivia nights, Bernick’s always steps up to help sponsor and promote our business. They have our back. Q: What’s Bernick's differentiator when it comes to the competition? You have a unique perspective given you own two completely different and unique restaurants, and opened Pacific Wok after you’d been at House of Pizza’s helm for awhile. Bernick’s service is their biggest differentiator. Their customer service is incredible and their product knowledge is expertly executed. They also offer added perks with their marketing and print shop that helps us with our promotion needs. That is a huge added value for us. It saves us a lot of time and money. Q: In all your years as a restaurant owner, what have you learned? I’ve been a restaurant owner for the past 16 years, and I am continually learning every day. It’s a fast-paced, never-a-dull-day industry. From a kitchen standpoint, I’ve learned new and tastier pizzas, how to make the environment more effective and efficient, and how to utilize new technology. There’s not a day that goes by that I don’t learn something. Q: Do you have a specific example of Bernick’s commitment to you and your customers? In October 2015, Bernick’s partnered up with us to celebrate House of Pizza’s 50th anniversary with an outdoor event. We had food, drinks, and live music for guests to come and enjoy. Bernick’s jumped on board in helping us with our anniversary celebration; they really wanted to be a part of it. They involved their soda and beer brands, did the marketing aspects, and helped promote the event to the local community. It was a great event with an awesome turnout, and Bernick’s was a big part of it. Thank you for such kind words and feedback, Brandon. We really appreciate it and your commitment to not only our company, but also this community. Without you, and so many others, Bernick’s wouldn’t be where we are today. 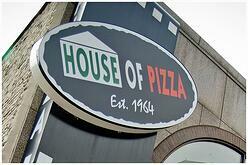 We are excited to learn and grow in our future with House of Pizza and Pacific Wok, and with all other customers, too. Our mission and values will continue to help us do this, supporting and servicing our customers with solutions benefiting all stakeholders.